Roosters don’t need to be loud. They can be quiet. 50% of chicken births are roosters. Bans are a death sentence without just cause. Bans make hens a target. It can be difficult to tell a rooster from a hen. Bans will make many special breeds of chicken extinct. General noise nuisance laws can be applied to a rooster. Having a ban is redundant. Rooster crowing is equivalent to dog barking and lawn mowing (all are 90 dBs). However, dog barking and lawn mowing are tolerated. It is an idea that sounds good on paper, but fails in practice. It sounds good because roosters crow. “Everybody knows that.” In an urban setting, you don’t want noise pollution. You don’t want to annoy neighbors because it infringes on their rights to enjoy their property. So let us ban roosters. As the mayor of Gaithersburg points out, a ban is “not necessary.” “You cannot remove a citizen’s freedom unless there is a darn good reason." Lifting the ban would not give someone the right to own an obnoxious rooster. We already have noise nuisance laws that apply to all things. Roosters won't have a chance at life without your help. Click here to voice your opinion. The sad truth is that roosters have a bad life in America. It does not have to be. At their loudest they are 90 decibels. The same as a dog bark. The same as a lawn mower. Yet somehow, dogs and lawn mowers are tolerated much more than roosters. There are very few places they can really live. The urban gardening and chicken raising boom outright kills nearly all rooster births. Roosters can be quiet. They can be muffled humanely with a simple collar that fits snug, but not tight, around their neck. Like a sock. It has no electronics, it’s very rudimentary. They can do all their chicken activities and make all their noises and they can still crow but that bellow becomes a burp because they can’t create the vocal pressure to annoy anyone anymore. Surgery is another option, but few people have the experience to pull it off. Here's an example of a patented rooster collar design. We are not affiliated, associated, authorized, endorsed by, or in any way officially connected with The No Crow Collar Company. Dr. Lonnie Luther PHD has a PHD in Poultry Science and has conducted numerous scientific chicken experiments with the FDA. He presents a letter stating that collars and surgery are both humane. Dr. Gregory Meyer D.V.M. is an animal doctor in Silver Spring with extensive chicken experience who keeps a flock of his own. He presents this letter stating that he has seen roosters that have used collars and find them to be humane provided the owner routinely checks the collar. Dr. Victoria Hollifield D.V.M. is an animal doctor in Gaithersburg who performs difficult surgeries on chickens. She has also seen roosters with collars and finds collars humane. Dr. Peter Brown A.A.S. has a degree in Poultry Science and is the doctor for the Chicken Whisperer radio show. 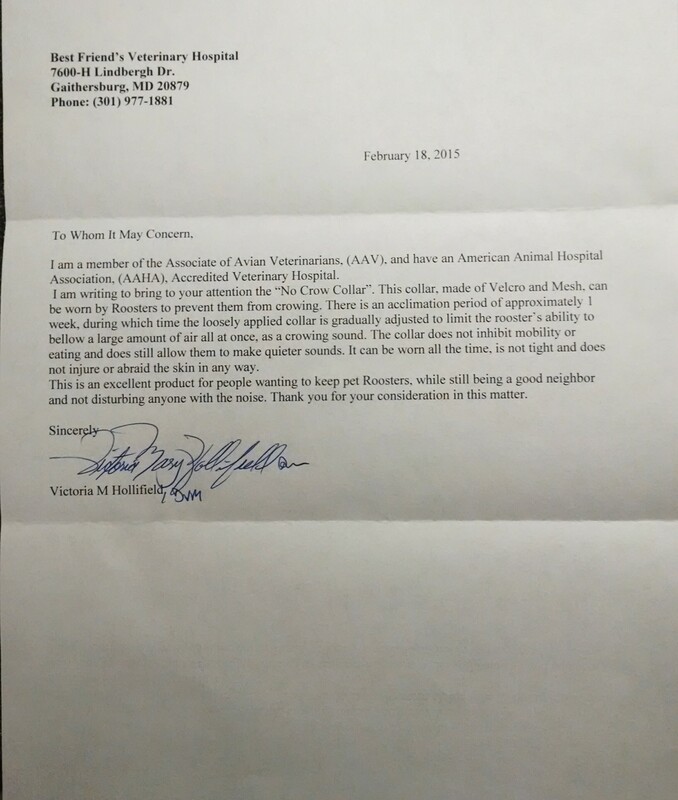 His letter also agrees that collars are humane. Knowing intimately the anatomy of a chicken, he finds collars will in no way harm the voice box of a rooster. Watch the video! Chickens adapt to collars just like dogs do. Having a rooster is “humane” for a flock of chickens. It calms the girls down. He prevents bickering. He finds food. He is on guard, offers warnings of hawks and provides protection. Plus, roosters are fun, have a lot of personality, and they are beautiful. Hens are becoming widely accepted in urban settings. That was a big step. To do this, most cities outright banned roosters to pass the "pro-hen" ordinance. Now that we've seen the benefits of keeping hens, removing the rooster ban is the next step. The City of Gaithersburg might remove their rooster ban. This will not happen without your voice. The mayor has already said the ban is not necessary. With your help, the council may reconsider their stance. If this happens, it will set a shining example for other cities to follow. Watch our progress on this issue. We owe much to hens and roosters, they make the traditional American breakfast of bacon and eggs possible. Let's give them a good life. It's payback time! Important: I value your privacy, if you copy me on your emails I promise that I will never sell or give your names to anyone else.